Cisco genuine SFP for 1000BASE-BX BiDi is 100 times more expensive than a compatible product. 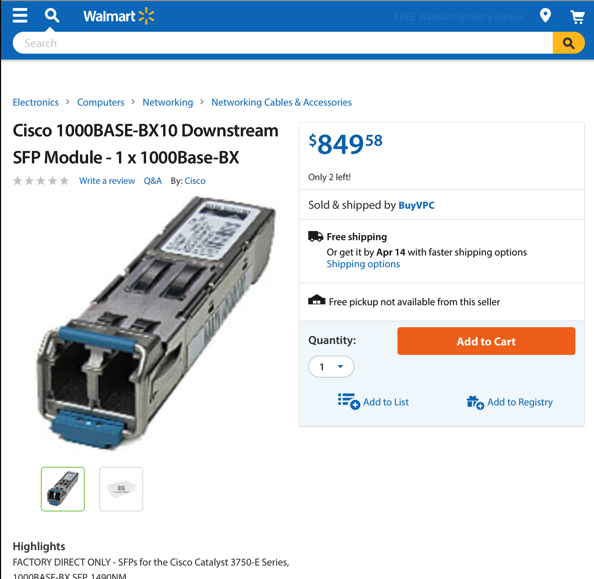 Choosing two random sites, Walmart sells Cisco genuine part for $829, Fibrestore sells same component for $7.29. Proving that Enterprise IT really doesn’t care about price, ROI, or value for money. Thats just management self-justifying their lack of talent and ability to measure risk. Private Cloud will never compete with public cloud while price distortions like this are commonplace. Oh, by the way, Walmart’s photo is not even of this exact module. BiDi SFPs have only one hole for a fiber. Yep. Shop around, the price doesn’t change much no matter where it is. 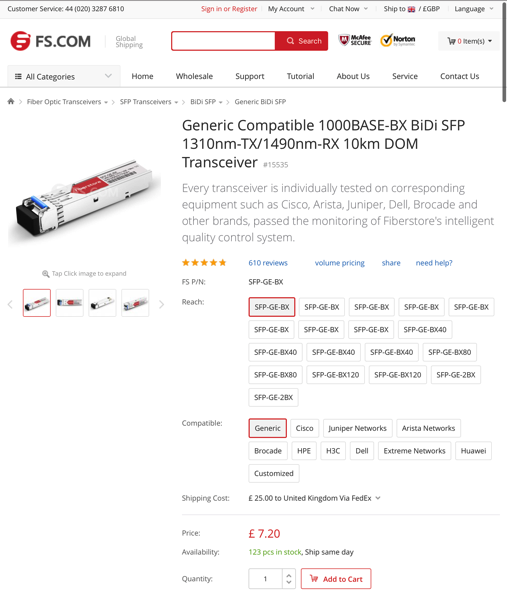 I’ve had good experience with 3rd party optics (OSI Hardware) at about 2-3% the price of Cisco (97-98% discount), even the 10G stuff. I’ve never used FS.com optics though, which cost even less. What are people’s experiences? Frankly, moving off vendor optics in any way is a huge money saver. No support issue with vendor when using compatible products ? Some people have problems, you need to have a level of technical competence to understand what to buy or not. Since you can save $40000 per switch, you have a lot of incentive to do that. Right ? The use of generic optic is fully supported on Nexus 9000 switches. So you can choose and still maintain support. I was buying few pairs of 1000BASE-BX-U BiDi SFPs at FS.com to test them. They work just fine. When i placed the order guy from FS.com asked me which switch exactly i want to use so they can test SFPs for compatibility. Good experience. One guy I talked to who worked for gov’t said that it was such a pain to buy something that if he wanted to get 3rd party optics it would be another RFP, so they just include optics with the main RFP for the project despite having to pay 100x the price. We receiving 90+% discount for genuine optics for top-3 vendor – which is fair deal to buy genuine instead of cheap China. Dismantle fs.com optics and eg. Cisco or high-end optics (Finisar, Avago) – You will see difference in manufacture. In operations there is very big difference in EMI between cheap optics and high-end – especially for higher speeds like 10G/40G/100G.